A window into US enjoyment of Spanish wines does not contain glass. Boxed-wine options are rising steadily, but it’s larger and smaller vessels that are arguably the hottest options these days. Wine stores are devoting much more space to cans, where Ah-So Rosé leads the way from Spain. Perhaps more surprisingly, kegs are gaining a strong foothold in restaurants. Among the strongest proponents of kegs, is Andre Tamers, owner of De Maison Selections, an importer working with many family-held properties in Spain who is bringing in 20-liter vessels from several regions. 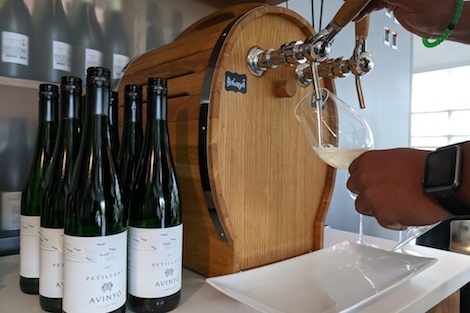 For the last six years, De Maison has been expanding its keg lineup, which now includes two whites (Garciarevalo Finca Tresolmos Verdejo Lías and Artomaña Txakolina Xarmant), a sparkling wine (Avinyó Petillant) on pre-sell, two ciders and three vermouths from Spain. “We have a very, very good presence in keg wines from multiple producers,” Tamers adds. Convincing vintners to go with anything but glass bottles hasn’t always been easy, partially because many Spanish producers worry that anything else will feed their fears that Spanish wines have a “too cheap” stigma attached to them. Happily, Tamers says, with kegs the image problem is nonexistent. For US consumers, though, 30 days is a more-than-acceptable lifespan for 3-liter bags in boxes. Interestingly, for years, both categories — boxed wines and Spanish wines — had perception problems around cost and quality in the United States. Now that victory has been achieved in both realms, 3-liter Iberian bag-in-boxes are starting to make significant inroads. Brands such as La Nevera and Borsao Viña Borgia are popping up on more retail shelves and restaurant lists. And one Midwest importer even has jumped on the bandwagon by aligning with a Spanish producer to bring in red, white and pink boxed wines. Besides being environmentally friendly, boxed wines’ durability makes it easy for consumers to enjoy one glass (or none) on a given night and not worry about spoilage. So it’s not surprising that in the last year, savvy Spanish producer Juan Gil has expanded its line of Shania boxes, adding sangria (which has been a successful venture for Reál) and Cabernet Sauvignon to its Monastrell, Garnacha Blanca and rosé options. In Minnesota, the Shania line recently moved to a larger distributor, prompting the “spurned” importer to improvise. This year, the Wine Company aligned with a Spanish producer to bring in red, white and pink wines under the Viña 425 label. The process Bailey used to find the wines speaks to the up and downsides for Spanish wineries in the boxed-wine world. On the other hand, the Viña 425 wines do not carry the producer’s name, Bailey said, out of concern that there remains a lingering stigma with some consumers around boxed wines. Two wines from bulk US producers, Black Box and Beta Box, still dominate the market. Because of the popularity of those two inexpensive domestic offerings, boxed-wine producers strive to keep their prices at or under $20 (which comes out to only $5 per 750 ml). “There’s a $19.99 threshold that seems to be where everybody wants to be,” Willenbacher said. There is plenty of incentive to hit that mark, he added, because boxed wines enjoyed 20% growth every year until 2017 when wine sales overall fell slightly. And now, a new demographic might further enhance sales of bags-in-boxes.